✅ORGANIC COCONUT OIL – HIGHEST GRADE AVAILABLE: Freshly made from Cold-Pressed Organic Coconuts, our coconut oil supplement are 100% Extra Virgin, Pure Unrefined & Gluten FREE, Non-GMO. 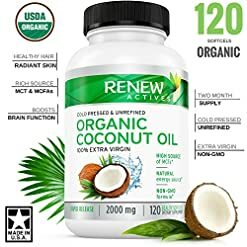 The best coconut oil pills and coconut oil for skin. ✅100% SATISFACTION GUARANTEED: Feel healthier with our pure coconut oil or your money back – no questions asked!